Civil engineering projects that shaped the outcomes of the March 11, 2011 Tohoku disaster extended well beyond those that affected the safety of nuclear power plants per se and encompassed dilemmas with which Japan has contended long before the advent of nuclear power generation. Flood amelioration efforts represent an especially apt case in point. Modern approaches to river control – lining rivers with cement and construction of dikes – in fact did much to channel Tohoku tsunami waters and accelerate their speed as they moved inland. Designed to protect and permit the development of lowland areas, these modern civil engineering projects represent the current end-point of an extended Japanese tradition of riparian control. This tradition was enmeshed in trade-offs between different economic and political interests, and new and older technological approaches. Comparison of two older efforts at flood control illustrates. The construction of the Okōtsu Diversion Channel on the Shinano River, Japan’s longest stream, was the end product of almost two centuries of efforts. Construction was ultimately only realized with the advent of modern engineering technologies. While construction created a clear flood tragedy and illustrated limits to the adoption of new technologies, Okōtsu represents the triumph of the modern which lies at the heart of much English-language writing on Japan’s late nineteenth and pre-war twentieth century history. In contrast, flooding in the town of Tochio, located on a branch stream of the same drainage basin and about ten kilometers south of the Okōtsu project near modern Nagaoka city, presents a different picture. This story is arguably more typical of pre-war Japan than Okōtsu. In 1928, at the same time that the Okōtsu project was being rebuilt, Tochio experienced a major flood that clearly illustrated limits on the employment of new technologies within Japan. It also highlighted the negative impacts of political modernization, a process which removed control over upland watersheds from locals and destroyed incentive structures to maintain them that in earlier decades had limited flood damage. Together, these examples illustrate the unevenness of “modernization” of a civil engineering trajectory that ultimately shaped key impacts of 3/11. Further, they place those developments in a broader, long-term context that suggests not only the constraints on the early process of engineering the environment, but also its planners’ limited awareness of the potential repercussions of these projects and their impacts on public welfare. [i] This characteristic was also manifest in 3-11, partly in the way in which the built environment – a good bit of it linked to control rivers as well as the sea, but also engineering associated with road and railways – shaped impacts of the tsunami, and partly in the inability of engineers and planners to envision what nature held in store for Japanese society. Some background is helpful for readers unfamiliar with Japan and to remind those familiar with Japan of salient elements of the geographic context in which civil engineering operate. First, North American and European residents are accustomed to urban and farmland areas that are relatively stable, with gentle slopes that stretch for a considerable distance; Japan does not enjoy such a luxury. Some 85% of Japan is mountainous and unsuited to dense population and agriculture. Although we call the area around modern Tokyo the Kanto Plain, it is a mistake to think it looks like The Netherlands or Illinois, for example, despite the typical relief maps that clearly conceal and “lie” about this fact notwithstanding (Fig. 1). Modern Tokyo Prefecture is very hilly, and very mountainous to the West. Even much of downtown Tokyo bears a stronger resemblance to San Francisco than Peoria, no matter how it looks in Figure 1. A close-up image (Fig. 2) still conveys a sense of a large flat area around Tokyo, and also in the upper left of the map, the Echigo Plain, although addition of river drainage detail reveals a greater sense of complex topography. As depicted here, coastal plains seem rather wide, but that image, too, is misleading. Why are maps drawn this way? Because the human eye can only readily distinguish five or so shades of gray or different colors, and using them to depict an island (Honshu) that at its widest is only 255 miles, but which has elevation from below sea level to over 10,000 feet demands coarse classification of elevation. Such “overgeneralization” makes it impossible for cartographers to differentiate the Kanto Plain’s irregular topography from the gentle slope of the Echigo Plain (to the northwest of Tokyo on the Japan Sea coast). For the same reason, coastal plains appear broader than they would if viewed from a train traveling along the shoreline (often less than three to five miles wide). Contrary to common map images, many Japanese communities are perched on steep hillsides. These are often quite precarious. While there is considerable regional variation, landslides are widespread. From 1950 to 2003, Niigata prefectureS (just one of forty-seven) alone experienced more than 4,500 slides, a number quite devastating. Thus, many areas have characteristics that those of us in North America and Western Europe associate with “marginal” lands. In Japan, given what is available for residence and cultivation, and given the prominence of irrigated agriculture, people live, work and play in geographic environments that people in other countries largely avoided. Areas like the English fens abound in Japan, but they are not historically considered to be marginal, just challenging. Further, locations where nuclear plants have been sited, very narrow coastal plains wedged between sea and mountain, may be particularly narrow, however, most coastal areas are very limited in breadth and only relatively broader. In contrast to much of the country, the lower reaches of the Shinano River, the Echigo Plain, are quite broad (although its inland elevations rise sufficiently to host ski slopes). It has a very gentle slope. However, its large rivers all come from the Japan Alps, from elevations 7,000 feet or more, propelling flows of great force. By virtue of this fact its rivers reveal two other characteristics of Japan’s rivers generally: the steep descent from mountain to plain, and further, the high precipitation common to much of Japan. The high precipitation is especially prominent along Japan’s “backside,” the Japan Sea side of the islands. This region takes the full brunt of prevailing westerlies that absorb moisture as they cross the Sea of Japan and then dump heavy rains and snow on the mountains of central Japan. To illustrate: Fig. 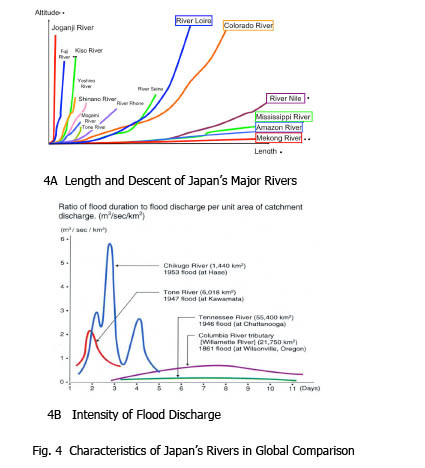 4A compares major Japanese river length and descent with major world streams. Fig. 4B makes the same comparison for peak flood discharge. Communities all along the narrow river valleys of Japan, not just the diluvial plains, face considerable risks from floods originating from high precipitation, rapid snow melt, or a combination of the two. The Japanese environment’s geographic challenges are reinforced by the nature of rice paddy agriculture. Paddy rice produces more calories per acre than any other plant, but grown in its most productive varieties it requires flat, impervious pans and well-regulated supplies of water, carefully controlled for depth and flow over the course of the growing season. [i] In pre-modern Japan, diluvial islands in rivers, lowlands such as the downstream areas of the Shinano, and the like were seen as valuable areas to exploit. While risk of flood was substantial, from the late sixteenth century Japanese made constant efforts to exploit these areas fully. Because of such efforts the province of Echigo (modern Niigata) became the most populous province in Japan outside of that in which Edo was located. This despite the province’s lack of any dominant city like Kanazawa (in Kaga domain, to the south of Echigo), much less cities on the magnitude of Osaka, Kyoto or Edo. For the examples below, this description means that the course of the Shinano and the extent of many smaller bodies of water changed greatly over the eighteenth and nineteenth centuries. Two maps illustrate. Fig. 5A shows the flow of the Shinano as it entered the Sea of Japan ca. 1600. Note that another river, the Agano, flowed into it, making a broad pool before emptying into the ocean. Note also the width of the river (orange) compared to modern streams (blue). By 1868, Fig. 5B, the situation had changed completely. The Agano now had its own independent mouth on the Sea of Japan, and while still broader than its modern counterpart, the Shinano’s stream more closely approximated its modern bed. Although difficult to discern on this map, note the light blue ponds and lakes that the cartographer has added to the modern map (roughly the center) to show the locations and extent of water bodies that have been drained since 1868 (most since the end of World War II). All suggest the susceptibility of this area to flooding, despite its high agricultural output. This background means that sites examined below (and many places nationally) where Japanese live might be perceived as poor, at lest through World War II. The prefecture had less industry and smaller numbers of wealthy families, but this did not differentiate the region from much of Japan. In regard to the issues under consideration here, it was generally typical. In dealing with geographic challenges the people of Niigata, indeed, the people of Japan, were quite willing to do all they could to control natural forces through civil engineering. Despite the sense among Japanese today (and many non-Japanese) that Japan has an especially appreciative attitude toward nature and lives harmoniously with it, the examples discussed below provide strongevidence to the contrary, even in pre-modern times. [i] The cases presented here are representative of a long tradition of riparian engineering and should encourage readers take a more skeptical attitude toward claims of a special, harmonious relationship between Japanese society and nature. This said, Japanese could pursue non-engineering options when dealing with the risk of floods. In particular, its rural communities practiced various forms of “zoning,” broadly conceived. In part this came through names attached to dangerous places, e.g., Ochimizu or “falling water,” Ochida, “falling paddy,” and the like. In other instances, the impacts of flood and other natural hazard risk were ameliorated through the use of joint ownership of arable land, under which share-holding cultivators received rights to cultivate the same proportionally structured, risk adjusted portfolio of fields. [ii] Finally, planners deliberately used a controlled release of water into runoff areas for which human use was restricted to low-value purposes. This essay, however, focuses on civil engineering since such efforts helped shape the impacts of the March 11 catastrophes. In brief, plans for a diversion channel south of Niigata town (now city) on Japan’s northwestern coast were first floated in the early eighteenth century, one of a number of similar projects in the region. Unlike projects on the Agano River and the Nishi River that were funded, the Okōtsu project was just too big to garner financial support prior to 1868 when the Meiji Restoration brought Japan its first, modern, centralized national government. Constructed or not, these and many other smaller projects demonstrate pre-modern Japan’s eagerness to re-shape its riparian environment. Shortly after bringing anti-Bakufu campaigns to a conclusion (1869), the new central government, anxious to garner support, domestic and foreign, and to project an image of modernity, announced its direct control over major rivers, and commenced large projects. Among the projects funded, the Okōtsu diversion channel was designed to ameliorate flooding in the most populous province outside of the Tokyo area. Construction proceeded quickly. By 1878, 90% of the 10-kilometer channel was dug; only the diversion weir remained to be constructed. Nonetheless, the vociferous downstream opposition to the persisted and ultimately the central government responded by sending two European advisers to investigate. Publicly based on their recommendations, but also likely reflecting a growing fiscal crisis, completion of the project was cancelled. Instead, the national administration encouraged local forces to focus on construction of dikes. They were to rely on their own resources, although modest central government expenditures later supplemented local efforts. Cancellation of the channel appealed to many who lived downstream from the proposed diversion weir, most influentially, the urban residents of Niigata town and their rural merchant allies. Some feared the large-scale disaster that would occur if the weir collapsed, as had happened elsewhere. Such a collapse would harm river-borne transport. 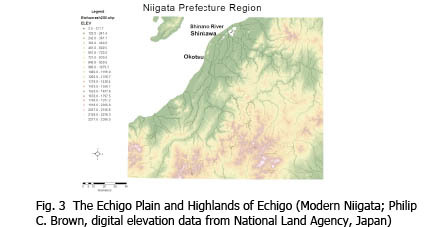 Others, including Europeans desirous of using Niigata as an international harbor, fretted that even a viable weir would slow the flow of the Shinano and exacerbate soil deposition, reduce the effectiveness of the lower river as a shipping route, and reduce natural scouring of Niigata’s already-shallow harbor (a seven foot draft) which struggled to handle Western commercial vessels. Whether in opposing the mid-nineteenth century efforts or earlier efforts, the opposition of urban residents and those connected to trade linked to Niigata won out through mid-nineteenth century. This pattern continued to dominate thinking until very late in the century. It also echoed divisions of power and economic role faced by proponents and opponents of nuclear power plants a century later. A combination of newly available resources from the indemnity China, incurred as a result of losing the Sino-Japanese War and disastrous flooding nationwide and especially in Niigata (1896) ultimately tipped the policy balance and the central government determined to invest in major flood control efforts, including Okōtsu. Under these circumstances, local opposition could not prevail, although even the opposition may have been weakened by the recent introduction of modern harbor engineering from the late in the nineteenth century. Construction took more than a decade (1909-1922). Throughout difficulties plagued the project. Excavations triggered landslides that silted up Teradomari fishing harbor. Corrective measures undid the damage, but at a considerable cost overrun. However, no one foresaw the real calamity, the 1927 collapse of the diversion weir. To opponents, this event proved the folly of the entire project. It completely stopped the downstream flow of the Shinano and re-channeled its waters down the diversion channel. Farmland was destroyed, transportation ceased, drinking water rendered undrinkable, salinization (as the ocean waters surged into the Shinano’s river bed) damaged downstream lands, and the lack of riverflow created a cesspool of flood debris, industrial, animal and human waste. Nonetheless, in concert with local supporters the central government pushed on with re-design and repairs, again opening the channel in 1931 and the channel has remained in use ever since. Yet questions remain about the unforeseen consequences of this and related downstream engineering, especially construction of diversion channels. Like New Orleans in the U.S., the downstream Shinano and city of Niigata are sites of some of the most significant subsidence in Japan, a result of reduced soil deposition, but also increased population and its consequent increased exploitation of sub-surface water. Population increase constitutes one of the paradoxical outcomes of flood-control – people’s faith in dikes and other projects’ ability to create a safe environment leads people to exploit lands still unsafe (as shown, e.g., by the Niigata floods of July, 2005). While increasingly accurate weather forecasting and speedy communications reduce the loss of life, and while the area subject to flooding has decreased, the constant dollar value of losses has increased over time. If a tsunami were to hit Niigata now, as it did in 1964, more people, more property and a larger area would be subject to the kind of lingering floods witnessed in the Tohoku after 3/11. While ōō’s history represents one set of paradoxes of technological modernization, The Great Tochio Flood of 1928 exemplifies both the selective implementation of such approaches and the limits to Japan’s technological and economic modernization. The end result was ecologically different than that seen in the downstream reaches of the Shinano. Situated just upstream from Okōtsu, on tributaries of the Shinano, the town of Tochio never benefitted from modern flood amelioration technologies. It continued to use largely the same approaches and technologies that would have been used 300 years earlier. During this flood, old-fashioned dikes were breached in 170 places; raging waters destroyed them completely at 42 places. Flooding washed away roads, rail lines and bridges. Of more than 1500 houses prior to the flood, fifty-nine were washed away entirely, twenty-seven houses not swept away were rendered completely unusable, 239 were counted as half lost, twelve were buried in mud, and water came up above the raised floors of 917 homes. Not only were these losses caused by a failure to implement more modern technologies and strategies of flood amelioration, an act of conscious politico-administrative modernization, but also by the unforeseen consequences of the implementation of a modern land tax structure. Based on the British model and successfully financing the new Meiji central government, the new policy divided lands into privately held and explicitly public lands. Communities that had previously managed commons (iriaichi), including many located in upland districts, were frequently denied managerial control of access to their benefits. The new tax structure thus destroyed traditional mechanisms of maintaining watersheds – sophisticated institutions for managing who could enter, how much grass, small timbers and other resources could be removed, and administration of punishments for violators. As in much of Japan, such lands provided locally managed resources for nearby villagers for centuries. Villagers of one community, or several hamlets together, practiced joint management rules that sustained these resources and maintained uplands as flood-reducing watershed. Once relieved of such control, watershed near Tochio began to suffer. The 1928 flood was not, in fact, a one-off event. It marked a crescendo of increasing floods over the decades since the implementation of the new tax structure. Townsmen attributed the increasing incidence of flooding to the denuding of a local mountain, Sumon. With the land tax reform, these uplands were taken over by the state, the mechanisms of local control eliminated, and no substitute provided. Consequently, its forest resources were wantonly pilfered by unchecked free riders. Had authorities recognized the value of traditional practices and made some provision for a functional substitute (if not maintenance of them), some flood damage might have been avoided, but as with tsunami markers in Tohoku, local folk knowledge was ignored. Had the new national land tax system left room for local governments to raise funds sufficient to finance construction of stronger dikes or to dredge more effectively with modern equipment, the erosion caused by denuding of the watershed might have been offset, but that, too, was not to be. Just as residents in the Tohoku area ignored stone markers set to remind people of the historical impacts of tsunami waters and built residences, shops and factories at lower levels, the leaders of the new Japanese government swept aside long historical practice as part of their effort to create taxable resources for a new, centralized state. The pre—war pattern of state control central to the stories of both Okōtsu and Tochio set important patterns for post-war management of riparian projects. These examples can be multiplied many times in both pre- and post-war eras, but most financing was and remains heavily dependent on the central government. National bureaucracies control planning, and while local input, as with Okōtsu, is actively sought, local knowledge is often ignored, and permits for suburban housing developments (e.g., south of Niigata city) are freely granted for locations that in practice have remained subject to flood hazards, despite expectations to the contrary. Risks frequently are deliberately masked — to the detriment of immigrants unfamiliar with local conditions or overly confident in the ability of modern technologies to protect their property. In popular understanding and official attitudes we witness the overconfidence invested in flood control as well as the breakwaters of the Tohoku coastal region or the safety devices of the Fukushima nuclear power plants. 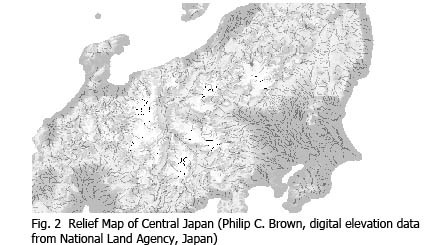 In ordinary times, riparian engineering projects can be seen as providing tangible benefits, but when extreme events strike (e.g., the Okōtsu weir collapse), the damage skyrockets and the overall cost-benefit calculation may be a wash.
Brown, Philip C. Cultivating Commons: Joint Ownership of Arable Land in Early Modern Japan. Honolulu: University of Hawai’i Press, 2011. Print. Radkau, Joachim, Joachim Radkau, and German Historical Institute in London. Nature and Power : A Global History of the Environment. Publications of the German Historical Institute. 1st English ed. Washington, D.C.
Cambridge University Press, 2008. Print. Thomas, Julia Adeney. “The Politics of Nature in Nineteenth-Century Japan.” Ph. D. University of Chicago, 1993. Print. —. Reconfiguring Modernity : Concepts of Nature in Japanese Political Ideology. Twentieth-Century Japan. Berkeley, Calif.: University of California Press, 2001. Print. The link between projects designed to address an environmental issue and unintended negative impacts on the environment I discuss here have been treated in other contexts. See, e.g., (Radkau, Radkau and German Historical Institute in London.). However, the impacts I note here have not been well explored in the Japanese context to my knowledge. It is a mistake to think that a) paddy rice is the only variety of rice, or b) that ordinary Japanese have traditionally eaten rice. There are upland, dry field varieties of rice, and others that simply grow in perpetually watered areas (like the shores of rivers in that drain into Charleston, South Carolina). However, these are less productive than well-regulated paddy rice. Until the late nineteenth and early twentieth centuries, when circumstances began to change, rice, especially that of good quality, was for the relatively wealthy and special occasions. Just as Japan has proven willing to force natural circumstances to bend to its will, the idea of “nature” itself has been subject to manipulation. See, for example, (Thomas Reconfiguring Modernity : Concepts of Nature in Japanese Political Ideology; Thomas “The Politics of Nature in Nineteenth-Century Japan”). (Brown) Historians of technology sometimes classify this kind of approach as “soft,” in contrast to “hard” measures like civil engineering projects, efforts to manipulate the environment physically. Philip C. Brown teaches Japanese and East Asian History, for the Department of History, The Ohio State University (USA). His work to date has primarily focused on Japanese history ca. 1570-1868. His most recent book, Cultivating Commons: Joint Ownership of Arable Land in Early Modern Japan (Hawaii UP 2011), addresses issues of agricultural risk diversification ca. 1600-1920. His current research focuses on flood and landslide amelioration in Japan, 1800 – 2000. 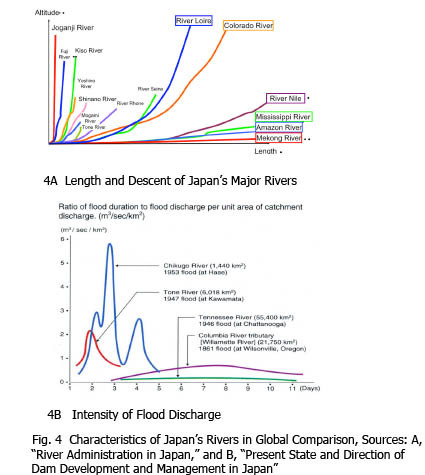 The historical perspective on what we might call the “second naturing” of Japan via civil engineering and flood control projects is very helpful, particularly the reminder that state formation/centralization creates opportunities for ignorance production. In this case, local control/knowledge gives way to national bureaucratic interests. I see one contribution Disaster STS can make here is to follow these historical projects “upstream” (sorry, couldn’t resist) to understand better how engineers and their professional interests and ideologies facilitated in this shift into modernization. There, I’d really want to investigate the assumption that increased future risk really was unforeseen or unforeseeable. My bet is that we’d find concern about these very risks voiced by engineers who face political pressure to tamp down their concerns. We find this same dynamic in south Louisiana, where biologists were predicting massive land loss from flood and river control projects as early as the 1920s — 70 years before it the problem came to public attention. Quite interesting. One immediate note: figure 5 is simply a repeat of figure 4; this presumably is a quick error that can be fixed. I found myself thinking of Richard White extensively while reading this, and not just because he has written about rivers. Two points jumped out. First, this seems to reiterate well White’s injunction to look at environmental attitudes through practice (work) rather than ideology. This piece clearly demonstrates that “living in harmony with nature” is problematic at best and requires more sophisticated analysis. Second, the hubris of the water engineers and nuclear safety engineers seems consistent with the hubris of the railroad corporations from White’s newest book. For future revisions, it might be useful to say a bit more about how the river control system facilitated the spread of the tsunami (and radioactive waters) further inland. I did not know this and a little more detail would have been welcome. I thought that this piece provided some interesting reading on the historical impulse in Japanese engineering and policy circles, and wanted to push the author to consider refocusing the paper’s conclusions on the application of this data to the Tohoku disaster case. Are nuclear power plants in line with broader attempts to “tame nature” or, as scholars like Gaby Hecht have argued, are they a different beast entirely? Should we envision the engineers who set up the seawalls in coastal communities along the same lines as those who sought to create the 3000+ dams in Japan? I echo the sentiments of the commenters above–this historical perspective is extremely helpful, and I would also welcome more connections to how this history impacted 3-11. It’s also interesting to see the work of engineers highlighted in this way, and in addition to Scott’s suggestion regarding looking at how engineers actually conceptualized risk, it is interesting to think about what your analysis might *do* for risk manager moving forward. Are these technological systems so deeply embedded that it would be difficult to dis-embed them? Are there movements to return waterways to local control? In other words, what might the way forward be? Thanks for this article Phil–I learned much from it! The parallels to development in (beautiful, but) marginal lands in the US, along the coast of southern California, for example, are striking. I hope we get the opportunity to draw out some of these connections. One thing I want to pursue with your paper is some understanding of the specific political process whereby local knowledge of hazards is replaced by the “second nature” Scott F. describes. In the US it is the case that hazard mitigation technology–with its armies of bulldozers and engineers–is the symbol of modernity. YET, localities still retain tremendous power when it comes to land use: zoning, building codes, enforcement, and participation in the National Flood Insurance Program. Do such vestiges of the pre-modern exist in Japanese local governance, sitting unused? Can/will/should a major disaster re-awaken a struggle for local control? And what would that even look like–might it connect to broader environmental movements? Phil: as with the other commenters, this was a super interesting and educational read for me. Indeed, I think Japan’s history of “riparian control” goes back several thousand years to early settlements on the narrow banks of upland streams, through subsequent moves to lower and flatter (and more flood-prone) elevations (if I recall my Totman correctly). It is especially illuminating to see these two cases presented together, in which we can clearly see the unintended effects on disaster risk of technological modernization (Okōtsu) as well as institutional modernization (Tochio). We can definitely hear the echoes in Tōhoku today. I would like to learn more about the institutional structures that govern riparian and other major engineering projects in Japan. This is a lacuna in my own knowledge and research that I hope to address in coming weeks and months, and your work provides an important historical foundation for understanding how these structures came to be what they are today, and why they behave the way they do. If you can recommend further reading on this, I’d appreciate your suggestions. Like Chris, I am eager to hear more about the way that the tsunami was channeled upstream by concrete banks and riverbeds. This is an especially significant concern now that government engineers have decided that rivermouth floodgates failed miserably on March 11, and thus current plans for most coastal communities would abandon floodgates entirely in favor of extending beefed-up seawalls back along the banks of the local streams. When I first saw these plans, I immediately thought that such a system would merely serve to facilitate a tsunami’s advance deeper inland, eventually to flood communities from above. Of course, I presume that the engineers have considered this, but… forgive my lack of faith. Incidentally, a consequence of the scale of these planned levees — and the fact that they are not vertical walls like those flimsy-looking structures that line the 17th Street Canal in New Orleans, but rather are elongated mountains of concrete — is that they will consume a HUGE amount of space in the already narrow valleys along the Sanriku coast. In one district where I have been working, the planned levee, along with the enhanced seawall and elevated roadway, would take up more than one third of the village’s former area. Needless to say, most locals are not happy about it, but funds are already allocated, and plans are in the works. I completely agree with you on the comment “National bureaucracies control planning, and local knowledge is often ignored”. since pre and post war period to the present time? Thank you for this very interesting insight of what I have called somewhere “a denial of topography” and which seems to have been fairly typical of the early 20th century. The same kind of ‘arrangements’ were made by engineers and urbanists in San Francisco, resulting of a structural weakness of the “made grounds” until today. I think your paper is a very powerful example of what is the geography of risks main argument: risk and territory “make” each other through time and space. This specific relation defines the territory “at risk” and shape vulnerabilities. I like the way your discussion brings together the multiple elements that come into the action into the composition of this risk-territory relation. By following them you are exposing invisible but strong pattern of the risk. I am also interested in the discussion that your are starting about the commons (but I guess I’ll find more in your book) and I was wondering if the commons in Japan have anything to do with the commons discussed in the “tragedy of the commons’ controversies. Thanks for this fine essay, Phil. One of the dilemmas I think we’re struggling with (and will be struggling with) in this forum conversation is the hazard of essentializing or making broad national or cultural attributions. So I’ll raise the following question with a recognition that I may be tending in that direction, or be seen as doing so. Can we infer anything from your analysis of water management and civil engineering about the historical evolution of larger attitudes in Japan regarding the relationship between humans and “nature” (the latter term being highly problematic, a la Cronon). In other words, do those activities as practiced in 18th-20th century Japan set a precedent for the way nuclear power plants were adopted and sited? Is there a “national technoscientific style” identifiable across these contexts? Also, I remain curious about the siting of nuclear plants in Japan — is it arguable that they tend to be sited in regions with less political power and social and economic status? This wasn’t part of your argument, but you may have some insights in this regard. One thing I really like about this essay is how it enriches the idea of local knowledge. Given that Niigata historically was one of a handful of ports in Japan open to international trade, you make it clear that “local” opposition there could encompass merchants and even foreign merchants. So much of the work on local knowledge in environmental studies dissolves local knowledge into some approximation of folk knowledge, which doesn’t bring to mind the technical knowledge that, say, a merchant might have about the draft of a ship. Picking up on Bill’s comment about the siting of nuclear power plants, I found your paper helpful for thinking about not only where nuclear plants are sited but also how these sites, once chosen, are sculpted. In the Fukushima Daiichi case, the existing hillside was taken down and leveled to a much lower elevation during plant construction, some say to facilitate access, but perhaps there were also aesthetics tied to civil engineering conventions at work, in terms of what engineers imagined had to be done to prepare a seaside site for industrial construction. Echoing some of the previous comments, this was especially helpful to think about the current disaster in historical perspective. This might shoot in a completely different direction, but I’m wondering if you’ve come across examples where these engineering projects discussed how they might affect population density around them. One of the things that is striking when comparing 3.11 to the earthquake and tsunami that hit Chile the previous year is how many more lives were lost. This is in part because the earthquake/tsunami in Japan was stronger, but also because there were more people living in the affected areas. As you conclude, these projects are meant to improve communities, but they also amplify risks that may turn the cost-benefit calculation upside down. In considering these risks, does population density get mentioned?